On October 11th, 2018, the Calvert County Sheriff’s Office Drug Enforcement Unit executed a search warrant on Cowpoke Circle in Lusby. Four (4) pounds of marijuana as well as four (4) pounds of marijuana oil/wax was recovered during the search warrant. The marijuana and marijuana oil/wax has an approximate street value of $35,000. A total of $9,850 in currency was also seized from the residence. 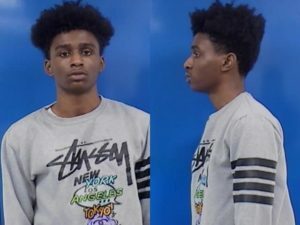 Alontre Dameron Strother, 20, of Lusby, was arrested and charged with Possession w/Intent to Distribute CDS. This entry was posted on November 6, 2018 at 6:44 am and is filed under All News, Calvert News, County, Law Enforcement, More News, z 600X120 Top Ad Bottom, z 600X120 Top Ad Top. You can follow any responses to this entry through the RSS 2.0 feed. That hair is a tangled crop of lice nests. 4 lbs of weed and another 4 of wax? That should get you free room and board. Between the pot/oil and cash, a 20 year old floating almost $45,000.00? Makes you wonder who floated him? He is definitely a FLOATER! Good question, I bet they are not going to forgive that debt.